"Circa primum sciendum est quod Philosophia hic introducitur sub persona mulieris, cuius triplex est racio: quarum una est quod tam apud Grecos quam apud Latinos philosophia feminini generis est; secunda quia sicut mulier lacte suo infantem nutrit, sic philosophia lenibus sententiis minus sapientes; tercia quia mulier naturaliter est magis compassiua et ideo aptior persona ad consolandum miseros et assidendum egris." Guessing none of these made their way into the blessing? They do remind me of Augustine's moving tribute to Monica, though, that he couldn't be satisfied apart from Christianity because he had sucked down the name of Christ with her milk. The linguistic gymnastics some ‘Spirit of Vat II priests’ go through to avoid any reference to God in masculine terms would be comical if it were not so subversive. The acid test for me, when older priests take this approach, is asking if they changed the Latin gender of the words when they were first ordained and celebrated Mass in Latin. "Since our new translation is closer and more faithful to the post-Vatican II Latin original, it has every claim to be welcomed as more authentically "the Vatican II Missal". The problem remains that it is the Vatican II Missal. I only can repeat that it would be very important to get the official permission to use the elder, "papalist" Anglo-Catholic, Liturgical English translations of the Tridentine Missale as well as the blessings, the funeral liturgy etc. as alternative "Extraordinary Form" for the Ordinariate, as these translations are part of the authentic Anglo-Catholic Liturgcial heritage, isn'nt it? 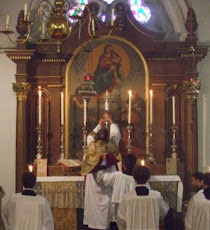 This would be a real mutual enrichment and fully in line with the Spirit of Summorum Pontificum. And then there was the omission of the 'mea culpa (x3)' from the (truncated) Confiteor, the omission of the 'holy' from the Suscipiat, the 'we believe'...I don't worry about prefaces and prayers because I'm usually reading the bulletin or turning around looking at the clock then.